Today I want to give you another insight into Leuven, which is not only known for having one of the best universities in the world, KU Leuven, but also the famous brewery, Stella Artois. Books and beer, this must be paradise, am I right? During the middle ages, education was mainly restricted to the upper class, and the distinguished rich students created a demand for special beers in Leuven. Thus, there is no coincidence that the largest brewing multinational in the world AB InBev has its roots in this historic city. One of the most important breweries in the middle ages was De Hoorn, which was founded in 1366. A couple of centuries later, in 1717, the company was bought by brewmaster Sébastian Artois, who changed the name into his family name but kept the horn as the logo. The pint of Stella, which means star in Latin, was just created in 1926 as a limited edition Christmas beer, but thanks to its success it became an export hit and eventually the most important product, lending its name to the company. Nowadays, we can order a pint of Stella in many countries worldwide. 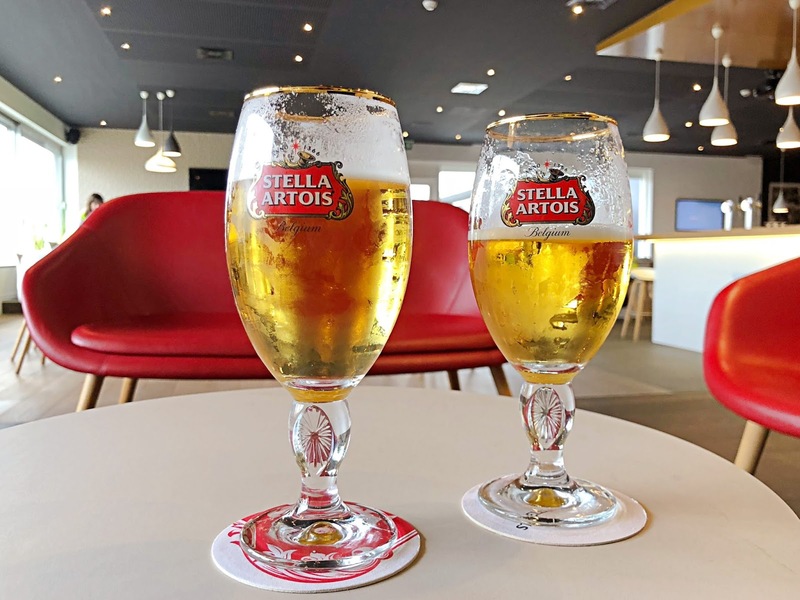 The promotion of Stella overseas was mainly possible thanks to the merger with the Brazilian AmBev in 2004 and the acquisition of Anheuser-Busch in 2008. Since the 2000's the number of beer lovers and tourists coming from all over the world to Leuven, to discover the story behind the pint, is increasing every single year. 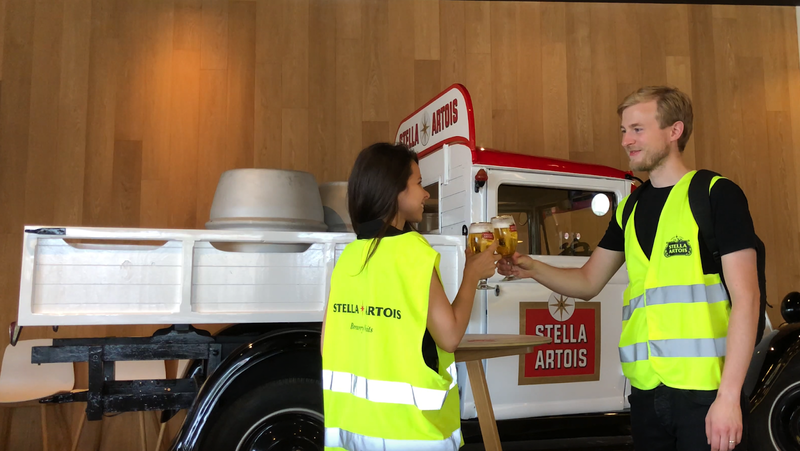 I had the pleasure to visit Stella Artois this month and I recommend the tour for all of you who like beer. In the first part of the visit, the guide takes us to a room next to the entrance to explain to us the history of the company. He plays short movies exhibiting old images related to the old brewery building and former brewmasters. For me, it was interesting to learn how the company bravely survive the second world war, having a part of the factory destroyed and the production suspended. Now we enter the heart of the factory building: the tun room. Here we learn how the raw ingredients turn into beer. If you like food engineering I'm sure this will be your favourite part, especially because of a fun and interactive presentation. All the beer produced at Stella Artois, which also includes Jupiter, Hoegaarden and Leffe, is bottled in the same facility, and we are able to see the bottling line as well. Last but not least, the guide invites us to the brewery's pub, where we can lean back and enjoy a couple of fresh pints! The tour is very short, it doesn't last more than 2 hours. It will perfectly fit in your agenda if you're in Leuven for just a day or even if you're staying in Brussels - Leuven is less than half hour away by train and the weekend ticket cost only €6.60 roundtrip. The tour in English takes place every Sunday at 3 pm (except on the 23/24/31 of December and the 1st of January), the admission cost is €8.50 and you can buy tickets online or in the tourism office of Leuven. I strongly advise you to buy the tickets two weeks in advance because they sometimes sell out before the date. Don't forget to check the video below to see the highlights of the tour. This article was proudly produced in collaboration with the tourism office of Leuven.